I don’t usually make astrological predictions in public, but keep an eye on the last week of August and the end of the first week in September this year. Volcanic eruptions are more frequent when the sun is quiet. They are often coincident with times when Lunar apogee or perigree is near full or new Moon. On August 25 at 5:52am an apogee at 406389 km will occur 12 hours after full moon. At the same time, Mercury and Venus are coming into conjunction between the Earth and the Sun. This is all caught in a line with Saturn on the far side of the Sun, and Jupiter and Uranus outside us. A fortnight later, on Sept 8 4:02am there is perigee at 357191km coinciding within 6 hours of new Moon. The conjunction between Earth, Jupiter and Uranus will be on the 17th September. Venus will make closest approach to Earth on October 26th. It could be a creaky couple of months for Earth’s crust. I may well be wrong, but bear in mind Katla is starting to rumble. This is the neighbour of the Volcano which caused the airlines to be grounded earlier this year. It’s eruption occurs every century, and is often presaged by the smaller neighbour. The eruption of this nearby long-dormant volcano in March and April 2010 prompted fears among some geophysicists that it might trigger an eruption at the larger and more dangerous Katla. 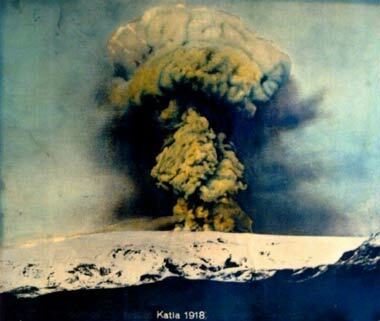 In the past 1,000 years, all three known eruptions of Eyjafjallajökull have triggered subsequent Katla eruptions. Following the 2010 Eyjafjallajökull eruptions, on 20 April 2010 Icelandic President Ólafur Grímsson said “the time for Katla to erupt is coming close … we [Iceland] have prepared … it is high time for European governments and airline authorities all over Europe and the world to start planning for the eventual Katla eruption”. I don’t think we’ve heard the last from the Icelandic volcanos either. The link below is the earthquake page for the Katla area, the large caldera to the bottom right is Katla, and there are a significant number of small earthquakes occuring as I post this. Looks very interesting Adolfo, thanks. Gray, yes, I picked up on the current earthquake swarm on WUWT today. There is another close Lunar alignment the day after tomorrow on the 13th too. Try this link, updates automatically. Thanks Vuk. According to Fourmilab, the main conjunction between Earth Jupiter Uranus opposite Sun and Saturn won’t be until the 17th September. I’ll see if I can work out the discrepancy with my plot. Update: My software agrees, it was me having a fat fingers moment. It looks like 8th September might be the date to watch, when lunar perigree occurs within 6 hours of new moon. [Reply] Thanks Tim, spelling fixed. Thanks for the heads-up TB, will be interesting to see what happens. There are also links between eclipses and tectonic activity and the next solar eclipse is due today – 11 July… now where’s my steel helmet??? Wish I was there! Sunny but with capricious strong gusts here today in the north UK. I bet it get’s breezy on the ocean surround Easter islands when the Sun suddenly disappears too. Tin hats at the ready for falling stone giants! Since you’re (not your) fixing spelling, how about grammar? “It’s eruption…” should be “Its eruption…”. [reply] I’ve always used the apostrophe for the possessive pronoun, and for abbreviation. Perhaps if you make a useful contribution to the blog I’ll make the change, just for you. Gail Combs has posted some good info on Russian volcanos. Seismicity of the volcano was above background levels all week. According to visual data, moderate gas-steam activity of the volcano were observing on Jule 2-4. Sometimes ash columns rose up to 5.3 km (17,400 ft) ASL. Clouds obscured the volcano in the other days. According to satellite data, a big thermal anomaly was registering over the volcano all week. July A gas-steam plume containing ash extended about 76 km to the south from the volcano on July 02. Seismicity was above background levels all week. According to seismic data, possibly ash plumes rose up to 7 km (22,900 ft) ASL on Jule 2-6. According to visual data, ash fall was observed on removal 30 km at volcano on July 05. Ash plumes from hot avalanches rose up to 4 km (13,100 ft) ASL on Jule 5, and strong fumarolic activity were observed in the other. According to satellite data, a thermal anomaly was registering over the lava dome all week. Ash plume extended about 20 km (65,600 ft) to the south from the Volcano on July 07. Seismic activity of the volcano was above background levels all week. According to seismic data, possibly ash plumes rose up to 2 km (6,500 ft)ASL on Jule 05. According to satellite data, a thermal anomaly was registering over the volcano five days. Clouds obscured the volcano in the other days of week. Ash plume extended about 20 km (65,600 ft)to the south from the volcano on July 07. Seismicity of the volcano was above background levels all week. Amplitude of volcanic tremor remains on levels 1.7-1.8 mkm/s and at increasing up to 2 mkm/s on Jule 6. Gas-steam activity of the volcano was observing on Jule 04. According to satellite data, the thermal anomaly over the volcano was registering on Jule 3. A gas-steam plume extended about 30 (98,400 ft) km to the south from the volcano on Jule 8. Clouds obscured the volcano in the other days. Strong volcanic activity of Klyuchevskoy volcano obscured seismic data of Bezymianny all week. According to visual data, clouds obscured the volcano all week. According to satellite data, a small thermal anomaly was registering over the dome on Jule 6-8. Activity of the volcano increases. Ebeko volcano is not monitored with seismic instruments. KVERT has satellite monitoring and occasional visual messages about this volcano. The danger of sudden ash explosions as high as 3 km (9,840 ft.) ASL as well as ash falls at Severo-Kurilsk, exists. So “brewing time”, after conjuntion/opposition with the help of moon´s lever, it is abou two weeks (two moons).Good! Two weeks is half a moonth. I have started looking at Volcanos of Ve5 and above. No very strong patterns yet, but Mercury conjunction and New Moon perigee seem to frequent features close by. Yes, in the last week in August, and the end of September, are both on temperature uplifts, and this is after a temperature drop through the middle of August. Just the type of temperature differential that will increase volcanic activity. So that is when, but where? Well curiously, the best look-backs one could use in long range weather forecasts also seem to work well with locations of volcanic eruptions. From the records of VEI4+ events, Indonesia would appear to be the likely region to be concerned about this Autumn. Really, others are turning into too boresome. The action is here, where the new empirical paradigms are found!. Some oppose current beliefs as the choir in a greek tragedy, just to reinforce them. Yes. Wouldn’t it be great to know where all those open flux lines go from the near equatorial regions! Good question TB. Could it increase the strength of the toroidal field and increase the EM field produce by the planetary dynamo(s)? If so, it may change the direction/strength of ocean currents. According to Leif, planetary magnetism is too weak to affect ocean currents. Vukcevic disagrees. I don’t know. It sure would be interesting to see the geophysicists putting time into finding out. One thing is for sure. There is no such thing as ‘open field lines’. I just want to know how far out into the planetary orbits the field is effective. The fact we can reconstruct sunspot numbers from the aa index shows the solar magnetic flux is geo-effective. As always, the question is about magnitudes. …..and the same source says that magnetism it is not caused by an electric field…That´s a version of the “Flintstones Universe”. Kristian Birkeland wrote:We will now pass on to experiments that in my opinion have brought about the most important discoveries in the long chain of experimental analogies to terrestrial and cosmic phenomena that I have produced. In the experiments represented in figs. 248 a-e, there are some small white patches on the globe, which are due to a kind of discharge that, under ordinary circumstances, is disruptive, and which radiates from points on the cathode. If the globe has a smooth surface and is not magnetised, the disruptive discharges come rapidly one after another, and are distributed more or less uniformly all over the globe (see a). On the other hand, if the globe is magnetised, even very slightly, the patches from which the disruptive discharges issue, arrange themselves then in two zones parallel with the magnetic equator of the globe; and the more powerfully the globe is magnetised, the nearer do they come to the equator (see b, c, d). With a constant magnetisation, the zones of patches will be found near the equator if the discharge-tension is low, but far from the equator if the tension is high. Weather on Earth has a surprising connection to space weather occurring high in the electrically-charged upper atmosphere, known as the ionosphere, according to new results from NASA satellites. What this means is, the earth acting as a CATHODE it is subjected to a variable current from the Sun, which when strong makes the jet stream get closer to the poles, while when low jet streams will migrate equator ward. That’s an interesting hypotheseis Adolpho. If correct, it would radically alter Stephen Wildes Hypothesis on how the oceans play a role in controlling climate. I think you may be mixing metaphors a bit though. The comments from Christan Birkeland may apply better to the Sun. It won´t alter S.Wilde´s hypothesis as Birkeland´s it is at a deeper level of causation. Meteorologist do not dare to go deeper. All what they say is true, but if we apply Socrates mayeutics we should ask for the next level of causation. What Wikipedia says is OK. as ion movement is both ways, but when, for example, we seek to obtain a copper sheet we do it at the cahode where cations, as copper, go. However, as NASA has observed and we have commented, there are two currents, one from the anode to the cathode and one from the cathode to the anode: The two “ladders to heaven”. …and, last but not least, Birkeland´s words are referring to his Terrela EXPERIMENT, a lab test. Adolfo, interesting, and I wasn’t trying to negate you. I agree that underlying Stephen’s a priori model is another causation level, undoubtedly celestial in origin, in my view. If Lunar tidal forces are a factor. there should be a peak at around 2 days after full and new Moon at the highest tides. Though less than half of all large eruptions in the last few hundred years have a significant lunar position. A Magnitude 7.4 earthquake has just hit Cristchurch, New Zealand! A big earthquake in the same area of the Ferbuary 27th. big 8.9 richter earthquake. Also the Planchon (big plate in spanish) Volcano is erupting, about 200 km. north of the above earthquake. Things are stirring at Grimsvotn in a week that saw Merapi, Anak Krakatoa and Shiveluch erupt. Coincides well with the Venus conjunction. A possible eruption has begun at Grimsvotn volcano, Iceland. A flood has started in Gigja in south-east Iceland. The disturbance occurred under the Vatnajokull glacier near Grimsvotn Volcano on Sunday afternoon. There was an increase in flow of water by 30 cm but other rivers running from the glacier are dry. The flood may take 4-5 days to reach maximum. On Sunday the volume of water in Gigja was 130 cubic metres per second, and electrolyte levels double that of normal. Grimsvotn is the most active volcano in Iceland. During the last Maunedr Minimum there was an intense volcanic activity which reached up to more than VEI=6. Fields are interrelated, thus we can no longer keep on subjective descriptions. Fortunately now, all data gathered by satellites are being “surprising” every time, as they do not validate “intelligent” concoctions but traditional knowledge. Interesting – also recent Russian and Indonesian volcanic activity! Further eruption at Merapi this morning. Another explosive eruption again this morning, with ash.gas cloud up at 6000m and more people being evacuated. “As I have stated the paleo data shows there have been geomagnetic excursions at the same time as the termination of past interglacial periods. There is also an increase in volcanic activity at the time of the geomagnetic excursions. It appears the same forcing function causes the glacial period to end, the cyclic abrupt Bond events, and the end of the interglacial period. As Bond noted in his paper there are cosmogenic isotope changes at all of the Bond events including the Younger Dryas abrupt climate change that occurred 12,800 years ago. Bond tracked 22 of the cycles and found that they have a periodicity of 1470 years. Seems an interesting correlation between lack of sun spots and Earth magnetic field. We are entangled in a soup of words and almost interred under infinite names of constants and “laws” named after some Holy scientific “Saint”. The Electric Universe has simplified things to electricity and I have had the opportunity of reviving traditional symbols, as the ICHTUS (Sin + Cos) = The mixing of the two forces, the alternate currents which when mixed at an angle of 45 and 135 degrees give birth to electricity and magnetism, and when approaching 0° between them they give birth to Gravity, by producing “mass” and “force”. This is what happens with the currents from the Sun while acting on the Earth, while being modulated by the other fields as the Moon. the rest of Indonesia has not been following the last week`s temp` profile. Ok it would be originally driven by an uplift in the solar wind velocity, which also causes the geomagnetic activity, but it does not have to follow that the geomag` is the forcing agent of the eruption itself. If you could get the local variation of the magnetic/gravity fields it would be really important, as all fields change one relative to the others. I am sure of it. Now we have the possibility, using an Ipod App to have the variations of local gravity acceleration. Thanks. This time round it won`t get burned, buried or banned ! That page is taking its time to load. Probably got a lot of traffic at the moment. Thanks for the video Roger – amazing! Here is a link to a Merapi web-cam so you can watch as it happens. Thanks Tenuc. Looks dark there t the moment. Are the speckles in the image white noise, ash or rain I wonder? Earthquakes happening in the Gulf of Aden, Pyrenees and now the Turkey-Syria Border region. Sunspot 1123 aimed some star stuff towards earth on 12 Nov.
Time to start checking changes in ALL the fields. (MAGNETIC,ELECTRIC, ELECTROMAGNETIC AND GRAVITY). Everything changes in known relations. I’ve gone to that link several times but not read it because of time constraints. I did read your post and the comments on it. I’ve just opened the second page on the link and I shall make some time and delve deeper. I very much lean towards the concept of inter-connectedness. My peferred mode of thinking and processing are analogue based rather than digital if that makes sense. Although being more comfortable with the humanities and arts and thus ruing the lack of science and maths in my education, I’ve always taken a keen interest in Science and search for knowledge and ideas. I despair closed minds! I’ve been delighted with your references to ‘The Glass Bead Game’ which I read many, many years ago. Earlier, I’d read Asimov’s Foundation Trilogy, as it was then, and was reminded of that when I read the Hesse. I seem to recall that Koestler and Colin Wilson also wrote about connections but called them intersecting lines or something like that. I’ve lost so many books by people not returning them and on reading your comments last week I ordered the Hesse book online. I also ordered ‘The Number Devil’ by Hans Enzensberger to give me a head start on my two year old granddaughter. You should know, also, that there is nothing obscure, esoteric or difficult to understand: Thus the opposite forces and its development were described by Pythagoras in his famous theorem of the square triangle, where the hypothenuse can be translated as “wave length” and each cathetes as one of the forces or charges, which we use everyday, in our time´s wave theory language, and if we imagine this triangle moving while growing, the hypothenuse grows developing an spiral following nature´s Fibonacci series, and increasing in “pitch” as the keys on a piano and as Galaxies and babies are formed.